I’ve worked with Susanna at The Rosemary House for a few months now and I am still amazed by how resourceful and sustainable both Susanna and Nancy (owner of Sweet Remembrances) are in their lives as well as their businesses. It’s encouraged me to adopt new ways of doing things and try to be less wasteful. One aspect I have adopted is recycling tea. The tea that isn’t used during store hours is often poured into pitchers and makes a delicious iced tea. This inspired me to take all the old tea we have in our house and start creating new tasty concoctions that will substitute the sugary beverage I’m always tempted to buy at the gas station. So far it’s worked well. I have been able to experiment with a lot of different flavors and herbs to make some interesting tea. My favorite so far has been mixing ginger, honey, and hibiscus flowers into a tea. Once it’s chilled it is a refreshing drink that is great for digestion and getting through the winter. The bright red color that comes with brewing the tea makes it even more inviting. I also enjoy mixing herbal teas with traditional green, white, and black tea. Iced raspberry leaf and white tea is great for the afternoon. It perks you up as you’re beginning to feel the three o’clock drag. Green tea also has the same affect. I often drink the green quince or green pomegranate we have on their own or with hibiscus flowers. Originally I never saw myself as much of a tea drinker. I had always been more than happy to grab some store-made iced tea along the way or even tea bags from (gasp!) Lipton or Bigelow. Now that I’ve started making my own, however, I feel better and look forward to what new flavors I can try. Let me know if you have any neat blends or ideas. I can always use a new experiment! Last Sunday I had the opportunity to work at The RosemaryHouse’s annual fairy festival. It was not the first time I had ever worked at a festival (I’ve done several seasons at the PA Renaissance Faire and a year at Pennsic) but I was amazed by how quickly and how thorough each part of the festival was organized and executed. For a weekend, the garden truly became something completely different. Unlike the other festivals I have participated in, this one was just for children. While many faires and festivals discuss being family friendly they do have some deviations. This festival, however, is definitely just for kids and I found that refreshing. It was nice to see so much focus go into the children having fun and making memories. There were plenty of activities for them and it was nice to see the parents enjoy watching their children have a great time. Even the people working and the parents become enthralled with the spirit. Before you know it, everyone is a fairy or gnome, knight, or whatever they want to be. The detail that The Rosemary House and Sweet Remembrances puts into the festival is what makes it so magical. Nancy makes sure her fairy lunches are absolutely perfect and delicious while Susanna and Lori work for days making each part of the garden a perfect home for a fairy. The whole block seems to be a buzz for a week before the festival. Everyone who works there does their best to make the fest as much fun as possible from fairy songs to the yearly fairy promise at the end. The children draped over their father’s shoulder or sleepily rubbing their eyes after a long day were still excited and smiling as I gave them their fairy name. Susanna and Nancy have a wonderful time creating the festival and it shows through each craft, play and song. If you are able to take your little ones to The Rosemary House for next year’s festival, bring your camera; you won’t want to miss a beat. I was able to snap a picture of this little fairy before she ran off to more adventures! A welcoming and brilliant pink plant to bees, butterflies and gold finches, Echinacea is a fantastic herb for an immunity boost during those winter months and it can be a great addition to your garden. 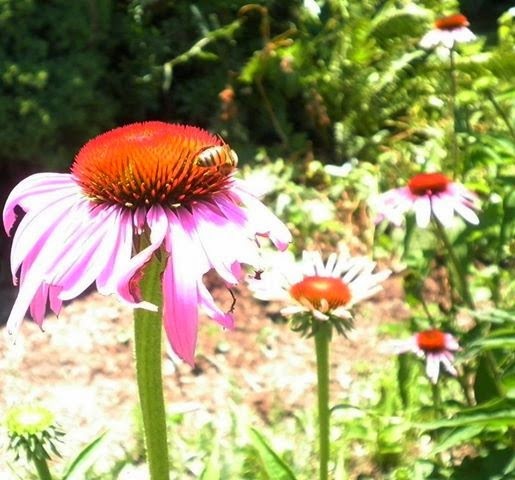 While many use Echinacea for it’s medicinal uses, it is also popular among those who landscape. The plant has tall, vibrant pink flowers and a unique cone shape, which catches the eye. Because of its height, many use it as a way to line gardens or property boundaries. It can look much more appealing than a fence. The plant needs to be divided into clumps about every four years according to Missouri Botanical Herb Garden to avoid over crowding. To make a tincture Sue Hess suggests quartering the heads of the flower before putting them into a food processor. After that you can pour grain alcohol and water over the mashed herb and let it sit for several weeks. While Echinacea can be made into other forms, I enjoy the tincture so it can be mixed into tea or soup, that way you can take your medicine but in a more comforting way. So as the school days drag on and the children begin to catch things here and there you will have something ready to keep them going until the holidays. "Through the Seasons" is in the works, and it will be our most ambitious project to date. 5 full years of The Essential Herbal Magazine (30 issues included - $150 single issue value - for only $48) covering the years 2008 through 2012. Perfect bound paperback with color cover. Over 400 pages (8 1/2 x 11) covering all of the ways we use and enjoy herbs. Chapters include topics such as: Medicinal information, Cooking with Herbs, Foraging, The Herb Life, Soaps & Body Care, Growing and Gardening, and Traditions. AND... Molly is finishing up an Herbal Word Puzzle book that will include 45 puzzles - a mix of crosswords, word-finds, and scrambles. All preorders will receive a pdf of it absolutely free - so be sure to send us the correct email address! They won't be on sale until after the special closes, and then they will go for $7.95. So take advantage of this offer today, and save big! Please let your herbal friends know so that they too can get this great deal. Thanks!